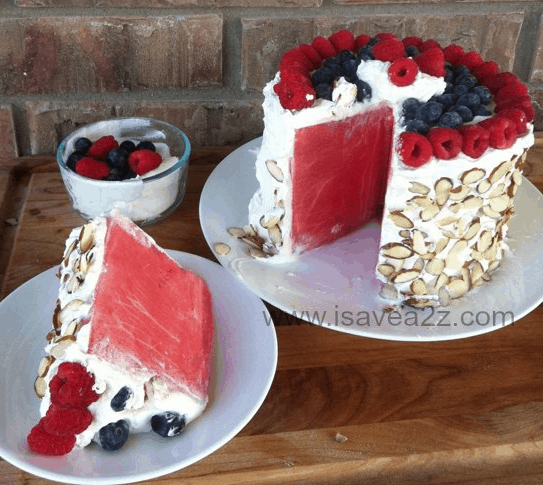 If you saw my No Bake Watermelon cake I bet your started looking for the Coconut Whipped Cream Recipe to go with it. 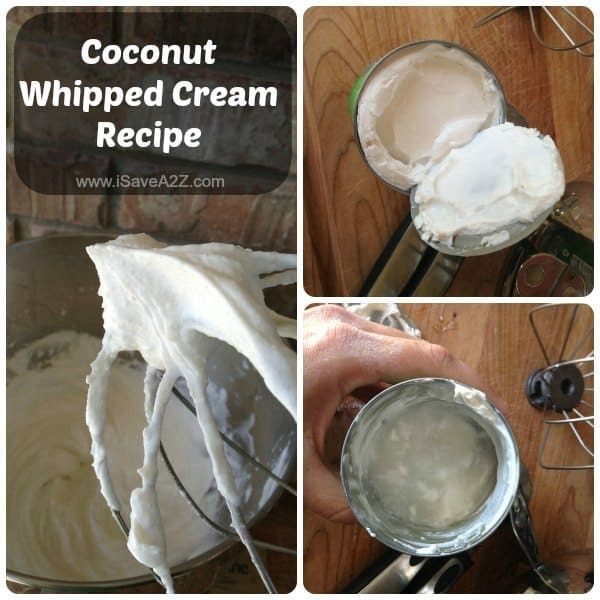 For those of you on the Paleo diet you will be extremely to happy this Coconut Whipped Cream recipe is Paleo approved! It does seem at times the Paleo diet can be a bit restrictive but not when you taste this whipping cream! It’s absolutely delicious! There are a few tricks to making this whipped cream though. It’s not as easy or as fast as regular whipping cream. For example, you will need to prepare to chill the coconut milk overnight to get the fat to harden and separate. This takes planning. Or, you can always keep a few cans on the fridge at a time and then it wouldn’t take long at all once this part is complete. But please don’t skip this step. The cream will not turn out the way it’s supposed to and you will have a big watery mess. There are many different brands of Coconut Milk. Some of these brands may be found at your local grocery store too. I tend to stock up and buy the Native Forest Unsweetened Organic Coconut Milk on Amazon because it comes in a twelve pack. I personally like the Native Forest brand because I get the most Coconut Fat from any other brand I’ve tried. It makes a lot of Coconut whipped cream! I’ve been tempted to try the Stainless Steel Creative Whip dispenser to create this whipped cream but haven’t purchased one yet. Stay tuned for a future post! I want one of these dispensers bad! Here are the ingredients you need to make Coconut Whipped Cream. Open the chilled can of Coconut Milk and pour out the watery Coconut Milk to use for something else. Use the remaining thick Coconut Fat to make your whipping cream by adding it to the chilled bowl. Whip the Coconut cream until it is nice and fluffy. Add the vanilla and sweetener and finish whipping the cream until it reaches a stiff peak as seen in my photo above. If you need it to be firmer put it back in the fridge until you are ready to use it. It may require a bit more mixing too. Store left overs (I never have any left over) in a sealed container for up to a week in the refrigerator. Now if you haven’t seen my No Bake Watermelon cake yet just head over here to see how you can make an amazing cake that is Paleo Approved! By Jennifer on July 2, 2013 Desserts, Paleo Recipes, Recipes. There are many coconut milk/cream/oil products on the market these days. I got the coconut cream mentioned above and have used that often. Some coconut “milk” products are really creamy, and some are quite thin. But, I wonder this: If we’re going to separate the “cream” from the watery part of the product, why not just use coconut oil to begin with? I suppose the “cream” has more coconut solids in it than the oil… i’m thinking this might require some trial and error experimentation before coming up with the right product. I’d hate to buy the milk and then throw half away if I can just buy the cream to start with and have it work just fine. I highly doubt the coconut oil would work. Whenever you touch the oil it practically turns to a liquid stat and you can’t have that consistency in whipped cream. I love coconut oil though! Instead of cane sugar, maple syrup, etc (all so very high glycemic and horrible for diabetics and others, instead use Organic coconut Palm Sugar which is unrefined, vegan, non-GMO, pure coconut flower blossom nectar, high in nutrients and 16 vital amino acids, LOW GLYCEMIC! It tastes great, and you use it 1:1 compared to cane sugar. My thought is if you make the whip cream too sweet, then the watermelon seems bitter by comparison. I buy it at my local food co-op, Super Supplements, or many companies online. It is light brown in color. I wonder if I could use the Cream of Coconut Milk instead of Coconut Milk. I have a can of each on hand at all times as my daughter has dairy allergy. Any thoughts? Trader Joe’s has Coconut Cream, thick right out of the can ! How much sweetener? I would like to use the maple syrup, but not sure how much to use… or even a ratio to the coconut fat! Did you ever figure this out?? how much to use? basically you make it as sweet as you like, whip the cream, add your chosen sweetener (you can use flavoured stevia liquids too) and just put as much as your personal tastebuds like!